"Hypebeasts" are a part of the tribe of diehard fans and entrepreneurs who make extraordinary profits in the Supreme economy of calculated sales, hype and exponential resale value. 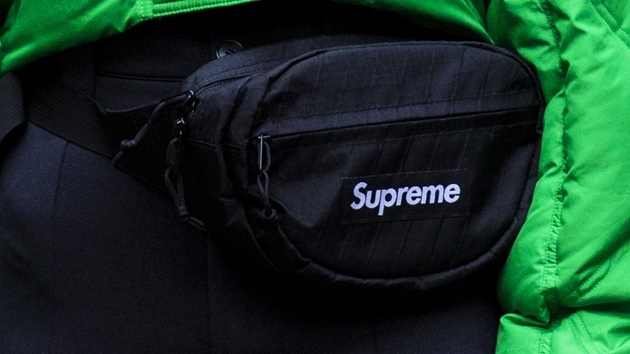 (NEW YORK) — Every Thursday morning at 11:00 a.m., Marlon Smith watches his computer or his phone, waiting for the newest Supreme products to drop. This has been his Thursday routine since he got into the game about five months ago — he’s admittedly late to it. Smith’s friends have been stockpiling gear like hoodies, sweaters, North Face jackets and sneakers from the brand for years. Now, Smith is also a part of the tribe of diehard fans (“hypebeasts”) and entrepreneurs who make extraordinary profits in the Supreme economy of calculated sales, hype and exponential resale value. “It was a lifestyle and then it became a part-time job, and I can make a good income,” Smith told ABC News. The 24-year-old is studying business administration at LaGuardia Community College in Queens, New York and works as a doorman in a co-op building near Brooklyn’s Prospect Park. Welcome to the hype economy, in which Supreme reigns…supreme. On Tuesday, online shopping and research platform Lyst named Supreme the world’s most powerful logo in its 2018 fashion report. “Supreme’s iconic red box logo is fashion’s hottest status symbol. From the 1,000 percent [spike in] search frenzy when sell-out collaborations launch, to the sky-high resale value of Supreme-branded pieces, Supreme’s was the most wanted logo of 2018,” according to the Lyst report. Former British child actor James Jebbia started Supreme as a skateboarder brand in New York City in 1994, and it’s made its way through skateboarding, hip-hop, sneaker and hipster culture ever since. Supreme is best known for its collaborations with premium mainstream brands like Louis Vuitton, North Face, Vans, BAPE, Gucci and Nike. But its clout reaches beyond clothes and accessories. For example, there’s nothing remarkable about this red Pilot marker stamped with the brand’s trademark red-and-white box logo, which goes for $40. (But it does.) Some may find it unfathomable that anyone can sell a Supreme logo-embossed brick for $260. Not to mention the frenzy that drove the price of $5.50 transit card in New York City to as high as $1,000 on eBay. Enter the hypebeast bubble: every Thursday, people like Smith, along with five of his like-minded friends, get ready to pounce and eventually cash in. These savvy middlemen invest in the resale markup, rather than the actual items they buy. Take the Supreme-North Face collaboration jacket Smith bought for around $300 a few months ago. He turned it around, selling it for $1,200, and now it’s worth even more. That’s a 400 percent markup. “The streetwear market is really about scarcity. Whether it’s Jordans or Yeezy or Supreme, it’s about not having enough supply to meet demand,” Matt Powell, senior industry adviser for sports at The NPD Group and self-proclaimed “sneakerologist,” told ABC News. “The scarcer the product, the higher multiple for resale. For instance, two weeks ago, Adidas released a Yeezy 700 that’s actually reselling below the original price. The suggested price was $300, and they were selling for $275 the last time I looked on Stockx,” Powell said. Equipped with bots that they have installed as apps into their laptops and phones, Smith and his friends virtually queue up. They spend about $20 to install the bots on their phones or $300 to have it on their computers. This software will even check the “I am not a robot” box that’s common on retail sites. The group spreads out the purchase since Supreme only allows customers to buy one of each item. They use different credit cards and even pay some people about $50 to ship the goods to their homes since using the same shipping address can expose multiple purchases, Smith said. Although it’s not officially advertised, fans have an idea of what’s going to be available by checking social media accounts, such as the Instagram pages “Supreme Leaks News” or “Supcommunity,” to get a feel for what could happen. In the handful of cities where Supreme has actual brick-and-mortar stores lines of hoodie-clad buyers snake around blocks. It’s hard to know how long the hypebeast premium will last, and that was the point Hasan Minaj made on an episode of his Netflix show “Patriot Act” on Sunday. He dissected the brand’s appeal, and delved into the estimated $500 million investment by The Carlyle Group, which raised Supreme’s valuation to $1 billion. The private equity group has long had positions in defense companies, but Minaj focused on its holdings in Wesco, an electronics company which supplies BAE Systems, a British defense company. The bigger threat to the brand would be if its patina of exclusivity were to fade. Smith said that on Thanksgiving he will still hit up the Supreme site to see what’s on offer. As he talked on the phone with ABC News, he stepped into a Dunkin’ Donuts, where he saw one of his customers. After seeing the sneakers Smith was wearing, the customer asked Smith to pick up a pair for him to buy. On Friday, the Supreme x Timberland 2018 World Hiker Front Country Boot will drop online and in the Manhattan, Brooklyn, Los Angeles, London and Paris stores. On Saturday, the shoes will drop in Japan.